On the internet there are so many Led Flasher’s projects, some even with low current consumption, but what I needed was a flasher to be used for geocaching, extremely small and that could last at least one year with a button battery. I started so a little experiments with the ATtiny85 low power modes using the sketch of insidegadgets, achieving a power consumption of about 4.5uA in standby and of about 3mA during the led flash that occurs every 4 seconds and lasts for about 30ms. In this way, the average consumption is around 25uA, which with a CR2032 button battery from about 220mAh, this means about a year of life! After a first draft of the project, I thought it might be useful to also have a 12V version so that it can be also powered by the battery of a car. And now another interesting little project. After seeing various online projects, especially based on the PIC microcontroller, I decided to make a charger for NiMH batteries driven by an ATtiny85. Why we need a microcontroller to manage charging a battery? The answer is very simple … The most economic charger that on the market, regulate the charge based on a timer, that is if I charge a 2500mAh battery for example, they provide a charging current of 250mAh, keeping the charge for eg 14 hours (a part of the energy will be lost, so 10 hours would not be enough). This way of charging NiMh or NiCd batteries is not very functional. It is a slow process, and does not guarantee a 100% accurate cell charge, as well as increasing the risk of overload. “Smart” chargers however, charge batteries correctly, but besides being quite expensive, their usually charge current is not very high, leading to charging times still quite long. Let us now try to understand the operating principle. First nickel batteries require a constant current to be charged properly. So we used a transistor-based constant current source, derived from what we saw in a previous post, and so far nothing special, but how do we know when the battery is fully charged? We need to constantly read the voltage of the battery being charged, and when there will be a maximum peak voltage followed by a sudden drop of about 20mV, the battery may be considered charged. This phenomenon (called Negative Delta V) is related to the chemistry of this type of battery, and allows to establish precisely the right moment to terminate charging. The schematic is pretty simple. The darlington transistor Q1 (TIP127), through LED1 (which must be absolutely RED) and the resistance R3 from 0.3 Ω, creates a constant current flowing in the direction of the 6-cell battery (7.2V), while the Schottky diode 1N5822, serves to protect the entire circuit in the case that is lacking the input voltage with the battery connected. The voltage divider R4-R5, serves to bring to port 7 of the ATtiny (A1) the battery voltage decreased to about 1/3, in such a way that it can operate with voltages up to 15V (the analog input of the ATtiny can not exceed 5V). The transistor Q2, driven by the port 5 of the ATtiny (D0), serves as a switch to enable or disable the LED-1 and the transistor Q1. It’s really important that LED1 is RED, and this is not a matter of aesthetics, but because the power output is given by the ratio between the voltage of the LED (the red LED is about 1.8 to 2.2 V) and resistance R3. Using a green LED, the reference voltage is raised, and consequently also the current rises (and not just a little bit). The circuit above, can deliver about 1.5-2.5 A: you may have to do some testing with various types of red LED, or vary the resistance, which must be at least 2W. If you can not find resistance with so low values, you can use 3 or 4 1Ω resistors in parallel. Another thing to remember, is the power dissipated by the TIP127, which can be up to 20 watt (depending on the current and the voltage difference between the input and the battery), then a heat sink need to be mounted properly. In my case was enough to use the aluminum enclosure. Last note is the input voltage, which must not be too high otherwise you risk to burn the transistor, but must not be even too low, because otherwise the dropout induced by the various components makes too low the charging current. Can fit approximately a difference of about 5V between the input voltage and the nominal value of the battery. For example, with 6-cell a voltage of 12.2 V is recommended (maybe 12). Of course you can also charge less cells, by suitably adjusting the input voltage. For a cell, we should feed the device with a voltage of about 1.2 + 5 = 6.2 V (maybe 6 or 7). Note the two gems that were not visible in the schematic. The ICSP connector (ie the ability to update the firmware on the ATtiny – via UsbTinyISP programmer for example – and the debug connector, to be connected to a TTL converter in order to read the battery voltage during charging. The J1 connector is a jumper that must be closed at all times, except when updating the firmware of Attiny85. Use negative deltaV to determine end of charge. Suitable for NiMh and NiCD battery pack. Default is for 6 cells 2500mAh. if (medium>maxmedium) maxmedium=medium; // save the value of highest medium in "maxmedium"
The code is pretty simple and self-explanatory. So here you have this long-awaited post. In this article we will see how to program some of the Atmel ATtiny family, particularly those highlighted in the title, using Arduino libraries and Arduino Uno as ISP. Obviously, everything can be done using a dedicated programmer, but here we will not talk about this subject because the differences are minimal. Let’s start with a premise: on the ATtiny we will not upload the bootloader, but we will proceed to load our sketch directly into the memory of the microcontroller. So this is a first difference with the ATmega328. There are perhaps some ATtiny bootlaoders, but it doesn’t make sense to load them for several reasons. The first is the small memory of this microcontroller (ATtiny85 has 8Kb compared to 32Kb of the Atmega328). Secondly, most of the ATtiny do not have serial hardware, so it would make not sense to install a bootloader if it doesn’t help to do uploads via serial port. Obviously with fewer pins we have a limited number of I/O compared to big brothers. As regards the programming is very similar to that seen in the previous post and the one before that. So if I want to use the PIN6 as a digital output I will use pinMode (1, output) and if I want to read the analog input from PIN3 I will use analogRead (A2). Of course, as in Arduino, we can use analog inputs as digital outputs. The serial hardware does not exist as we said, but we can use the appropriate PIN2 (PB3) as unidirectional software serial. 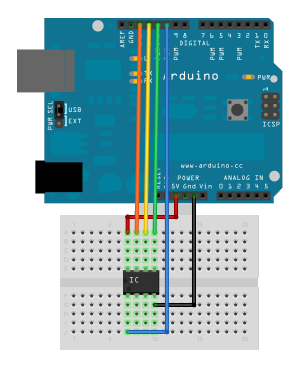 Practically using the standard Arduino command Serial.begin (9600), on PIN2 we have a TX signal that can connect to RX pin of an USB-SERIAL converter, in order to communicate from the ATtiny to the PC, so it’s like having a “read-only serial”. But let’s get to the point: compared to the programming of the Atmega328, the programming of the ATtiny requires some changes and the adding of some libraries to the IDE. I recommend using the 0023 version of the IDE, which can be downloaded from the website of Arduino (with other versions it was unsuccessful), and create a separate special folder to be used only ATtiny programming. So if we already have Arduino (for example in the c:\Arduino folder), we will create a new folder called for example c:\Arduino-Tiny. Basically, it’s like the ATmega328. The pin 10 need to be connected to RESET, and pins 11, 12, 13 to pin MOSI, MISO, SCK (ie in this case 5, 6, 7), and of course the power supply. Remember as always to insert the 22uF capacitor between GND and RESET on Arduino UNO otherwise the board will reset and the upload will not work giving you an sync error!!! At this point, opening our IDE, and an example sketch, we can select Tools -> Boards -> ATtiny85 @ 1Mhz, then File -> Upload to I / O Board. It will give you an error of type “PAGEL,” but you can safely ignore it. You will then see the message “Done Uploading” that will warn you that everything was successful. As you can see it is very simple. The ATtiny by default have fuse set in a way that the microcontroller uses its internal oscillator at 1MHz. And this is the best option for most projects, but if you need more speed, you can program the ATtiny in such a way that it uses its internal oscillator at 8MHz or by using an external oscillator at 16Mhz (see previous posts) . If we want change our ATtiny speed, for example at 8MHz, we need to set the fuse, doing an upload of a empty bootloader, containing only the settings that interest us. To do this, simply select from Tools -> Boards the setting of interest (eg ATtiny85 @ 8MHz), and then Tools -> Burn Bootloader —> w/Arduino as ISP. read operation not supported for memory "lock"
This error is due to the fact that the is missing the line that concerns the operation memory lock in file c:\Arduino-Tiny\hardware\tools\avr\etc\avrdude.conf the line that concerns the operation memory lock. #   ATtiny85 has Signature Bytes: 0x1E 0x93 0x08. Now running the bootloader operation should go. 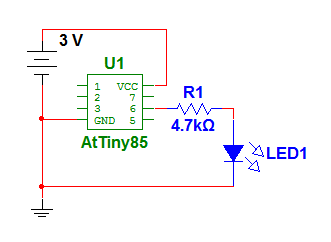 In this way, the error is corrected but only on Attiny85. To solve the problem for other microcontrollers, here I have given you a starting point. If you do a search on google with the error appearing during the bootloader upload you will find the solution. There may be an additional error (I can not remember the message) when you upload very large sketchs. In this case, I remember it was related to a AVR-gcc bug, and in order to resolve it, I needed to download the WinAVR tools, install them, and copy the contents of the folder c:\WinAvrtools in c:\Arduino-Tiny\hardware\tools replacing all files (except previously edited file avrdude.conf). This last part is a bit more complicated, but you will see that if you will follow everything it will not be difficult. At the next post then! In the previous post we saw how to program the Arduino bootloader on a standalone Atmega328, while in another post we saw how to upload the sketch to the microcontroller with Arduino bootloader on board. 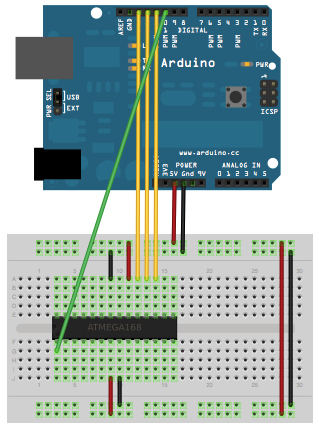 In this post I want to highlight what I believe is the ultimate goal of the projects prototyped with Arduino: program the ATmega328 without a bootloader, so that our programs can completely override the flash of the microcontroller. But why do we do it? The main advantages are the immediate execution of our program when the Atmega power on, and more space for our programs in the memory of the microcontroller. The disadvantage is the fact that it is no longer possible to program via simple serial (less than reload the bootloader), but we must use a dedicated programmer (or a ArduinoISP) and the time to upload the sketch is a lot longer. I advise you to use this mode only on finished project, while using the Arduino bootloader when we are debugging our programs (with continuous uploads). With this addition, we specify that the upload of the sketch does not have to end up on our Arduino UNO, but on the Atmega we want to program. Also note the change (optional) atmega328bb.upload.maximum_size whose value becomes 32768. Basically it is the maximum space in bytes available to load our sketch. There is no longer the bootloader so the freed space is available to us. And that’s it … We programmed the microcontroller to work standalone without Arduino bootloader and without (or almost) external components. As you can see it is very simple and allows us not only to program the ATmega328 standalone, but also a full Arduino board. For example I use this system with the Arduino Mini Pro. These are budget boards, which have nearly all the features of the Arduino UNO, but they are very small. Usually, instead of using a standalone Atmega328 within a well-defined project, I use these small boards, and once everything is ready to be canned, I upload the sketch bypassing the bootloader, in particular to make faster ignition. The Arduino Pro Mini is produced by Sparkfun and is available in 3.3V or 5V and with ATmega168 or ATmega328. I would recommend if the sketch does not exceed 16kB to use the ATmega168 and the 8Mhz version at 3.3V especially if your project is running on battery because it consumes a lot less. Obviously during programming we have to select the corresponding tab from the list of boards, for example Arduino Pro or Pro Mini (5V, 16 MHz) w / ATmega168. With this system we can also program the ATtiny, the younger brothers of the Atmega. There are several versions but the most interesting are the 8-pin ATtiny85 and the 20-pin ATtiny2313. They have the advantage that consume very little power, are smaller and cheaper. The ATtiny85 has only 5 I/O, but for many projects is just fine, considering the cost of about € 2.50 in Italy. Moreover working with internal clock to 1Mhz consumption is really very low, and the size is like that of a NE555. In the next post then!